(L-R) Susan Rogers with Ryan Thompson, Health and Safety Specialist, and Mark Wroten, Plant Operator, who were instrumental figures in the win for Plum Point. (L-R) Walter Stone, VP, Environmental; Steve Hedge, WA Parish Plant Manager; Craig Eckberg, Director, Environmental; pose with NRG EcoNRG Stewardship award. In order to be nominated for the Plant of the Year award, plants need to demonstrate all-around performance in safety, environmental stewardship, station adversity, and outage/project execution. 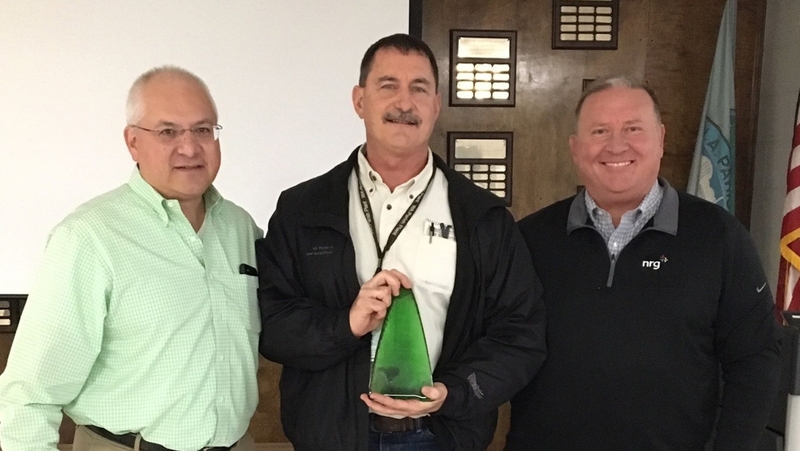 Mike Levesque, Plum Point Plant Manager, accepted the Safety and STRIVE Award at an NRG town hall meeting on February 28th. 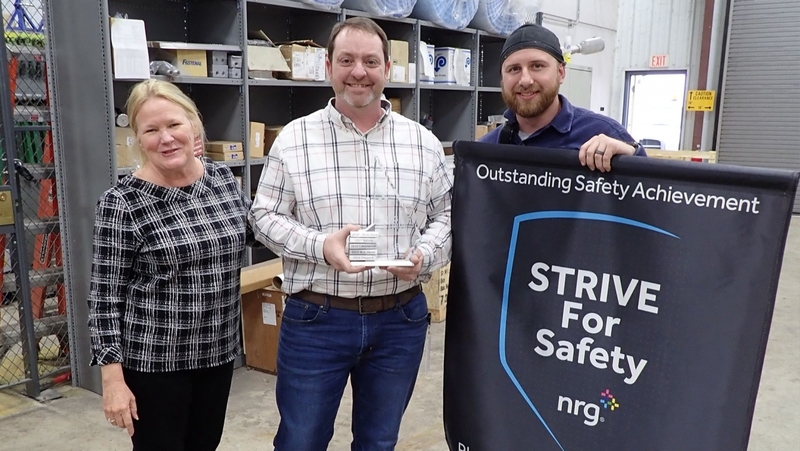 “To be recognized among your peers as a leader within NRG’s robust safety culture is deeply humbling, but it is also a testament to the hard work put forth by this outstanding team of caring professionals at Plum Point. We are truly proud of our effort during this record year for NRG, and with the same enthusiasm we look forward as one team focused on the safety and well-being of everyone here and everyone around us,” said Levesque. Eligibility for the Environmental Award depends upon a review through the the ecoNRG project committee for all projects across NRG. WA Parish’s ecoNRG projects included awarding four scholarships to high school students from Lamar Consolidated ISD. Plant personnel replaced on-site traditional landscaped areas with “xeriscapes,” which are landscaped areas that do not require supplemental watering. Additionally, they hosted a group of eight birders who identified 53 bird species on-site as part of the Brazos Bend Christmas Bird Count. WA Parish also organizes 2-3 plant tours a month for students and community members, highlighting the plant’s operations and environmental control systems. Congratulations to the 2018 Safety and Environmental Award winners and nominees!